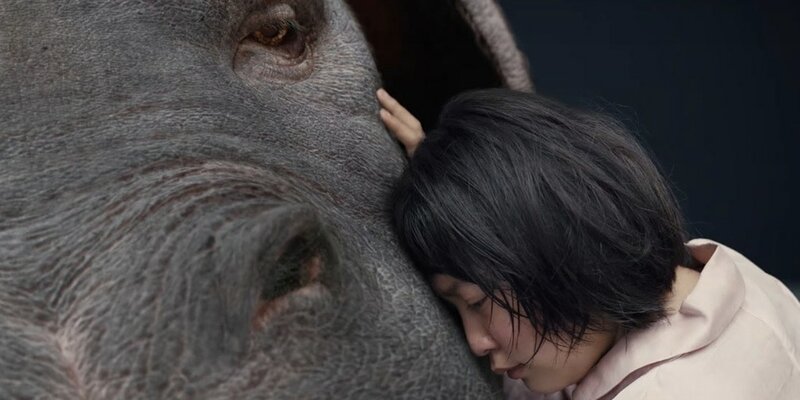 THE STORY - For 10 idyllic years, young Mija has been caretaker and constant companion to Okja - a massive animal and an even bigger friend - at her home in the mountains of South Korea. But that changes when family-owned, multinational conglomerate Mirando Corporation takes Okja for themselves and transports her to New York, where an image-obsessed and self-promoting CEO has big plans for Mija's dearest friend. With no particular plan but single-minded in intent, Mija sets out on a rescue mission. THE GOOD - Beautiful visuals, both in terms of color, framing and the visual effect creation known as Okja. A delicate and heart warming score. THE BAD - Odd scripting beats and bizarre performances that don't match the story being told. If any film is ever going to make you want to become a vegan, it's probably "Okja." Filmed with an artistic eye by South Korean filmmaker Bong Joon-ho ("The Host" & "Snowpiercer"), the film explores the relationship between a little girl and her abnormally large pig, or "Super Pig" as they're called in the film. "Okja" is a stunning creature to behold both to those within the story and to those watching at home on Netflix or in a movie theater. No matter how you choose to watch "Okja," there is no denying that this piggy is out to steal your heart. Lucy Mirando (Tilda Swinton) is the CEO of a powerful food/distribution company called The Mirando Corporation. Their big marketing plan involves breeding super-sized pigs across the globe over the course of 10 years, at which point they will have an extravagant pageant to choose the best one and proceed to slaughter them all behind the scenes, once the cameras stop rolling, for public consumption and profit. One such pig named Okja is being raised in South Korea by a young girl named Mija (Ahn Seo-hyun) and her grandfather Heebong (Byun Hee-bong), until one day, TV personality, corporate poster child and zoologist Dr. Johnny Wilcox (Jake Gyllenhaal) comes to bring Okja back to America. Refusing to let her beloved Okja go, Mija sneaks away with Okja, hoping to bring her back home when she meets devoted animal lover activists Jay (Paul Dano), K (Steven Yeun), Red (Lily Collins) and others, who also wish to free Okja and expose the atrocities being comitted by The Mirando Corporation in the process. Coming hot on the heels of "Snowpiercer," Bong Joon-ho continues his practice of mixing South Korean actors with American actors in a manner that makes sense towards the story and never feels out of place. Both the tranquil Korean outdoors and busy jam packed streets of New York City are stunningly shot by Joon-ho and cinematographer Darius Khondji ("The Lost City Of Z"). The colors pop right off the screen with a vibrancy and saturation that helps to give the film a beautiful, almost surrealistic quality that is breathtaking at times. This is backed by the delicate, simple yet gorgeous score by Jaeil Jung. However, it's the visual effects which stand out the most as Okja herself is a truly breathtaking creature, filled with personality and scale. Sure, these may not be the best visual effects you are to come across all year but they are very serviceable in providing Okja with the humanity she needs in order for us to draw an emotional attachment to the relationship she shares with Mija. It's in the acting and bizarre scripting elements that "Okja" stumbles a bit. Both Tilda Swinton and Jake Gyllenhaal (The two biggest names in the film) are overblown in their acting decisions and play their roles as campy as can be. Tilda, we kind of expect this from (See "Snowpiercer," seriously) but this is new territory for Gyllenhaal. Never before have I seen him give us a performance such as this. Normally I would say this is a good thing, as it is interesting to watch the actor stretch his talents further. However, in terms of how it suits the story and fits in tonally, I have to question it. With a high-pitched voice and an eccentric nature that is wilder than Okja herself, Gyllenhaal is completely unrestrained in this otherwise tender and heartfelt story. Swinton, I am more forgiving towards but a forced gimmick at the end, leading her to play dual roles, once again feels out of place and unnecessary for the story other than to give the actress something interesting to do. The ones who give the more humanistic portrayals, mainly Ahn Seo-hyun as the young Mija and Paul Dano as the devoted leader of an animal rights group, fare much better. Other odd decisions from Joon-ho include the use of the "F-word" which surely contributed towards this film receiving an R-rating. There are also moments of harrowing violence but I would argue those moments are not in poor taste and are necessary rather than gratuitous. While "Okja" certainly has some flaws it is altogether a stirring film that is technically well made. A bizarre script, with odd beats and character moments, hurt an otherwise beautiful picture with the relationship between a young girl and her pig at the center of it. Okja is a dazzling creation of visual effects wizardry brought to life before our very eyes and thankfully, Bong Joon-ho gets that element and the sentiment absolutely correct. It may be a bit messy at times but "Okja" stands as one of Netflix's finest films.